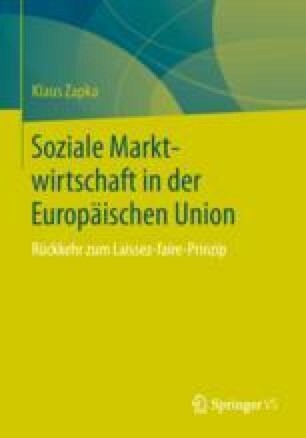 Eine „finale Vollkommenheit“ der Europäischen Integration als futuristische ‚Politische Union‘ (Möschel 1992; Giering 1997, S. 62; Streeck 1998; Tömmel 2003, S. 1) wäre nicht ohne die Leistung eines hohen Preises zu haben. Vielmehr ist sie mit erheblichen bis völligen Souveränitätsverlusten des Nationalstaates verbunden, der neben low politics (market politics) auch ihre identitäre Substanz bei high politics (public politics) verliert: „Low politics is a concept that covers all matters that are not absolutely vital to the survival of the state as the economies and the social affairs. The low politics are the domain of the state’s welfare. This concept is the opposite of the high politics which concerns the state’s survival and strict national security… The international relations were based on a simple interdependence scheme based on the national security: high politics, and that nowadays the international relations are ruled by a complex interdependence based on domestic issues: low politics“ (Jackson und Sorensen 2007, S. 106).